Who is at risk of carotid artery disease? How serious is the problem? Do I need treatment? Carotid arteries are the two blood vessels which offer the main blood supply to the brain, and are located on each side of the neck. 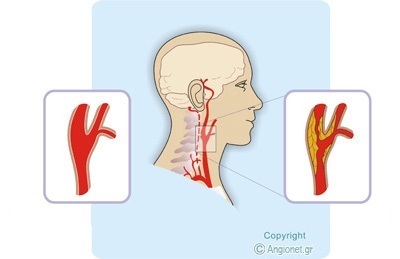 Eack common carotid artery divides in two branches: the internal carotid artery (to the inside of the skull) and the external carotid artery (to the outside) carotid. The two internal carotid arteries supply the brain, in fact mainly its front part, which controls our thought, personality, speech, sensory and motor function of the body. The two external carotid arteries supply the face and the head. Normal arteries are smooth and unobstructed on the inside. As years go by, their inside lining becomes thick and narrow because atheromatous plaques build up in their wall. The plaques are made of cholesterol, calcium, destructed cells and fibrous tissue. This process is called atherosclerosis (or hardening of the arteries), and is similar to furring in the water pipes. A plaque may be complicated by bleeding in it, cracking of its surface and blood clotting. Complicated atherosclerosis may cause narrowing (stenosis) or complete blockage (occlusion) of an artery, and usually occurs close to the areas where arteries divide into branches. When enough plaque builds up to disturb blood flow through the carotid artery, physicians call the problem carotid artery disease. Carotid artery disease may not cause any symptoms in the early stages. Unfortunately, the first sign of the disease may be a major stroke, which permanently affects brain function. However, you may have warning symptoms of a stroke, called minor stroke or, more properly, transient iscaemic attack (TIA), which temporarily affects brain function. A typical TIA ususally lasts several minutes, although it may last longer, however, it resolves completely in less than 24 hours. Common symptoms of a TIA include attacks of weakness, clumsiness, numbness or pins and needles of the face, arm or leg on one side of the body. Occasionally, the speech centre in the brain is affected resulting in slurred speech or inability to speak. In other cases, when debris and clots block the artery of the eye, the result is loss of vision in one eye for a few seconds. This is called amaurosis fugax. Despite its name, a minor stroke is a major cause of alarm. Although these symptoms may go away completely within 24 hours, you should not ignore them. If you have a TIA, you are at high risk of a serious stroke, and you should report it to your physician immediately. Carotid artery disease caused by atherosclerosis, regardless the presence or absence of symptoms, usually affects people of more advanced age (usually over 60 years) and is commoner in men. Transient iscaemic attacks (TIAs) are much commoner in smokers, diabetics, people with high cholesterol and people with high blood pressure. It is estimated that 5-10% of people over 65 years have a carotid artery stenosis >50% related to atherosclerosis, which may have caused no symptoms. Among people with coronary or peripheral arterial disease, the percentage of those with carotid artery disease is as high as 20-30%. The main test done to detect carotid artery disease is colour-flow duplex ultrasonography. This painless test can show your physician how open your carotid arteries are and how quickly blood flows through them. Another diagnostic test is digital subtractive angiography (DSA) of the carotids, which is an imaging investigation using x-rays to take pictures of the arteries by injecting contrast in them. This test is performed under local anaestesia in your groin or arm, where an artery is punctured. DSA carries some risks, including a small incidence of stroke, which is the main reason why the physicians don’t use it as the first test to diagnose or follow up carotid disease. Nowadays, this invasive test has essentially been replaced by CT Angiography (CTA) or MR Angiography (MRA) of the carotid and brain arteries. Other investigations may include: brain computed axial tomography (CT) scanning and brain magnetic resonance imaging (MRI). It is estimated that carotid artery disease is responsible for about 40% of ischaemic strokes. If you have a carotid artery stenosis greater than 50-60% and symptoms of a transient iscaemic attack (TIA) or of a minor stroke, you are at increased risk of a serious stroke in the future. If your vascular surgeon recommends carotid surgery, the procedure should be performed as soon as possible after the warning TIAs occurred, because the risk of further strokes is higher in this early period. If treatment delays for any reason, the risk remains increased for almost 12 months, especially for the first 3 months. In certain cases, people with a significant stenosis of a carotid artery without any symptoms (asymptomatic stenosis) may also benefit from surgical repair of the lesion, although the risk of a stroke is lower in the absence of warning symptoms. Certain factors should also be taken into consideration before deciding whether an operation of the carotid artery is expected to be beneficial to the asymptomatic patient. Such factors are the life expectancy (it should be over 5 years) and the absence or coexistence of risk factors for atherosclerosis which are not well controlled (current smoking, uncontrolled high blood pressure, uncontrolled diabetes mellitus etc). There are three lines of treatment: medical treatment, carotid surgery and carotid angioplasty-stenting. Carotid artery stenting (CAS) – This is a new procedure which is currently controversial because conclusive, long-term results are not yet available, and large studies are still done. It is usually performed under local anaesthesia. Using x-rays and contrast to take pictures, the surgeon advances a wire and a catheter to the carotid artery and then inserts another catheter that carries a tiny balloon and a stent (tiny metal-mesh tube). The balloon is inflated and the stent expanded to fit the dilated artery and hold it open. CAS may be a good alternative for selected patients who have medical conditions that increase the risk of open carotid surgery or when open surgery is expected to be too difficult (scars from a previous operation, radiation therapy in the neck or a short neck with restricted mobility). Your vascular surgeon is the only physician qualified to offer all types of treatment for carotid artery disease and, therefore, able to recommend the option which is best for you. Carotid endarterectomy has very good early and long-term results. This treatment reduces the risk of stroke from 1 in 5 down to 1 in 25. The main danger is that a small number of patients (between 1 and 3 in 100) will suffer a stroke during the operation. This stroke may be serious. There are possible complications of carotid surgery, like damage to a nerve near the artery, which, however, are uncommon in experienced hands. These nerve injuries are usually temporary and may include hoarseness of voice, difficulty in swallowing, moving the tongue and numbness in the face or tongue. Carotid artery stenting seems to have good mid-term results for stroke prevention, but this procedure should only be performed on patients at very high surgical risk for the open operation and only at centres with special experience in this procedure. Its long-term results have not been adequately studied yet. If you have a transient iscaemic attack (TIA), consult your doctor immediately.